Since 2000, every July, Ome goes back to the past: it lives the Celtic era through its tradition and custom. The magic happens in the amazing Maglio Averoldi Park in Ome (Brescia). 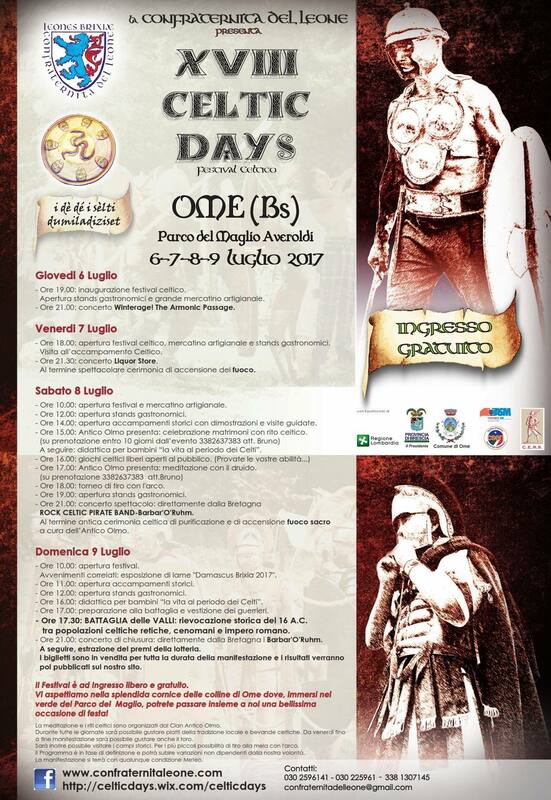 Celtic Days is the festival of the history and culture of Brescia and it’s organized, like every year, by Confraternita del Leone (the Lion Brotherhood), a cultural and sport association based in Rodengo Saiano (Brescia). Confraternita del Leone is made of scholars and people keen on history that, through theoretical studies and the practice of historic sword use and archery, want to let tradition, custom and battle techniques live again, as well as the everyday life of the Celtic population of Brescia. Guided visits to the historic camps and an exhibition of ancient jobs will be organized throughout the festival, battles and armed combats will take place. It will also be possible to eat traditional Lombardy food. There will be games, music, dances and an arts and crafts market and, on Sunday afternoon, the big battle between the ancient populations will take place.